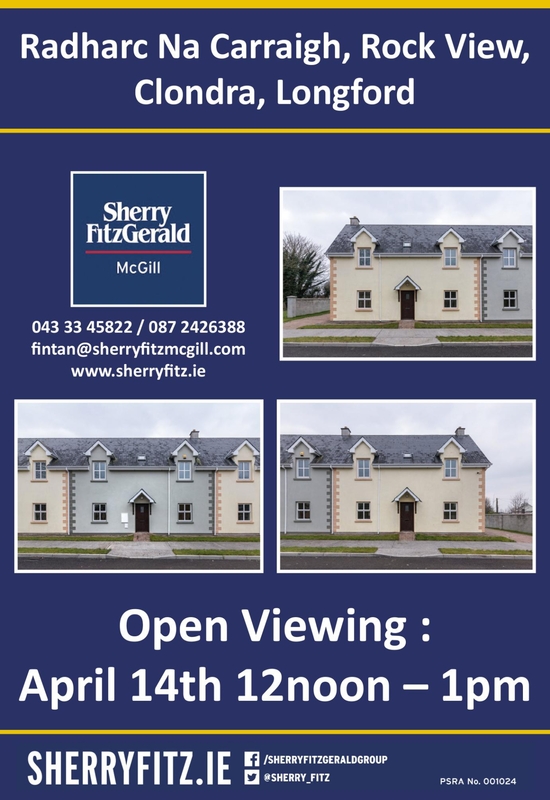 House hunters are likely to descend on Longford in their droves this Saturday, April 14 for an open viewing at Radharc na Carraige in Clondra, from 12 noon to 1pm. Radharc na Carraige is located in a select development of only five dwellings in the beautiful and picturesque village of Clondra, along the Main N5 - Strokestown road and within six miles of Longford. A mere 100 yard stroll to the new marina on the Royal Canal which has gone under extensive modernization and currently providing access from Dublin to the River Shannon and beyond. The development consists of five four bedroom houses of high specification finishes throughout. Accommodation includes Master bedroom en-suite, fully fitted kitchen and utility room, downstairs wc and shower room, full tiling to bathrooms and selected flooring throughout. Each house has the benefit of parking with generous gardens and private access road. The development has ample amounts of public open spaces providing safe play areas for children.